The DPF is monitored constantly by the Engine Control Unit (ECU) through several sensors which are attached to the DPF. These sensors measure temperature, oxygen content and exhaust gas pressure. 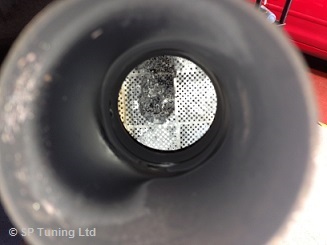 When this filter becomes full the vehicles engine programming will elevate exhaust temperature or produce high amounts of NOx to oxidize the accumulated ash to aid the cleaning out of the DPF, this is known as "filter regeneration". This process will happen periodically or when high levels of soot are detected in the system. Depending on vehicle manufacturer, a warning light will illuminate on the dashboard indicating the system needs regenerating. This process can only take place under certain driving conditions which will be explained in the owners manual. 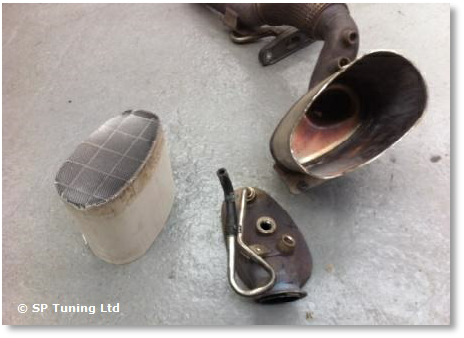 DPF Removal costs range from £299.00 inc VAT to £499.00 inc VAT. Please contact us by phone or email for a quote for your vehicle. Please Note that DPF removal is only intended for track use vehicles and not for road use. 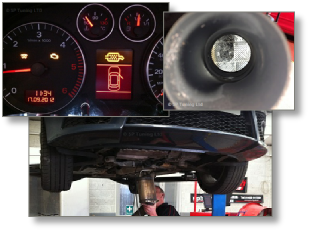 WHAT IS INVOLVED IN DPF REMOVAL? First of all, the DPF hardware needs to be removed from the exhaust system and this can be achieved via two methods; (i) a replacement pipe can be fitted (only available on some vehicles) or (ii), the current DPF pipe can be modified by removing the DPF brick from the inside. Both of these methods are permanent and tested. Next, the software needs to be removed from the ECU of the car so that the active and passive regeneration cycles, and any other DPF functions are no longer in operation, this is done by reprogramming the ECU.